Though it is only eight years old, Instagram has set many popularity records for social media. Within three months of its launch, it had reached the magic figure of 1 million downloads, becoming the fastest social media platform to reach that figure. In under two years, it had reached 25 million users and by June 2018, it had crossed the 1 billion active users mark! It is now second only to the behemoth of social media platform- Facebook. With more people accessing the Internet from mobile devices, Instagram hits a nerve as it works extremely well on the mobile platform. Moreover, it is primarily an image-sharing app and we all know that images rule the roost on the Internet. Instagram is constantly making itself more attractive to its users by introducing new functions and features. After launching the Stories feature, which has become one of its most popular features, Instagram introduced IGTV on June 20, 2018. Though videos have been part of Instagram for nearly five years, they were short-form only. IGTV supports long-form videos of up to an hour’s duration. Moreover, this video app is built for mobile user engagement as the videos are played full-screen and vertical in portrait form. So no need to twist your phone around to enjoy the video full screen! IGTV is a service within Instagram and has its own standalone app, too. You can watch IGTV videos within Instagram or on the separate IGTV app that is available for download on both Android and iPhone. The fact that videos are the number one engagers on the Internet, along with the above numbers and the amalgamation of best features of YouTube and Snapchat Discover, should convince you to give your brand marketing a 2019 makeover with the use of IGTV. Let your followers be a part of all the excitement and buzz by sharing your event videos with them. These videos can be taken at exhibitions, awards ceremonies, conferences, publicity events, product launch parties, etc. Company event videos are excellent at conveying the impression and emotions of the moment to the audience, thus making them a part of your process and forging a greater relationship with them. Invite your users to look at how the products and services they love are made available to them. Let them be a part of the process by posting behind-the-scenes videos of your facilities, employees and processes so they can better understand and appreciate, as well as identify, with the brand. 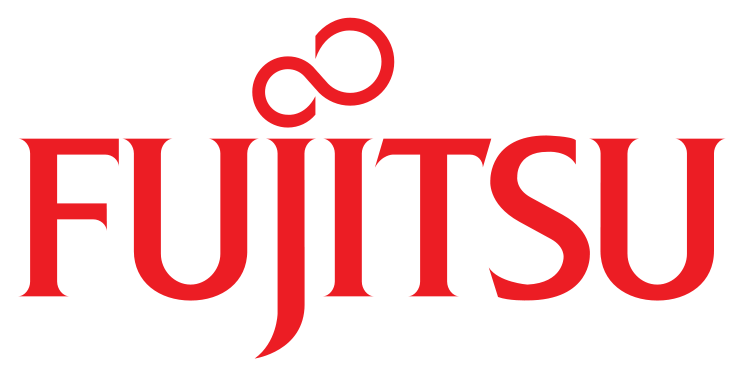 These videos are great when there is an interesting event taking place – like the commissioning of a new facility, the building of a new plant, a new product launch, etc. These videos provide an in-depth view of your brand. They can be used to educate the viewer about an important issue or cause. They are excellent to put your point of view across in a convincing manner. The documentaries can be about your people, products, their development, etc. Posting reality games and shows are audience magnets. They keep users coming back to view the next episode to see what happens next. These shows can be released one episode at a time and later compiled into a series. These videos can be repurposed as highlights to enhance engagement, shares, and likes. 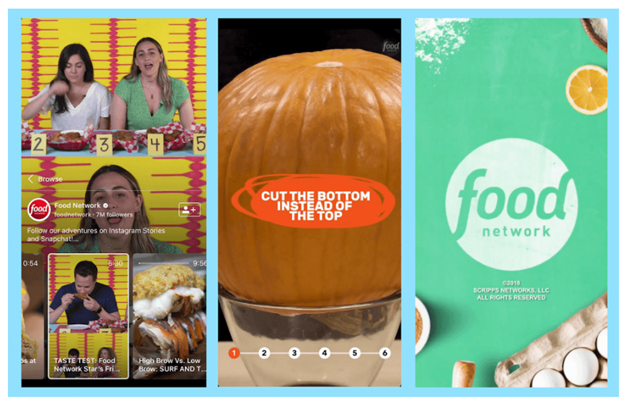 IGTV with its support for long-form videos is an excellent launch pad for these videos. Posting videos with questions and answers is another way you can use IGTV. Create videos of FAQs to answer common queries and problems that the users face. Also, when you are launching a new product, this format can be used to explain the working and use of the product. These videos will be an extension of your customer support efforts. It should be between 15 seconds and 10 minutes long. It should only be vertical with an aspect ratio of 9:16. To get the most out of IGTV, we’ve put together a set of best practices you must follow. Read on! Convert your blogs and stories into videos, and use long-form videos on Instagram to reach a new audience. Your old videos from other social media platforms can be reused on IGTV, but videos shot in landscape mode will need to be edited to fit the vertical portrait format of IGTV, but it is worth the effort to connect with new users. Make sure that your channel and videos are searchable by optimizing them. Write a compelling title that uses keywords to make it SEO friendly, and don’t use long titles; keep it short and sweet at 15-20 characters. Add descriptions with keywords and use many hashtags, which will both help people discover your videos. Including clickable links in your description will also help generate traffic to your website or landing page. Since it is still a new format, it is difficult to know the ideal length for a video. So, experiment with the video length by posting videos of varying lengths to see which ones are the most effective. Use IGTV’s “View Insights” option from its menu to see how your video has performed. 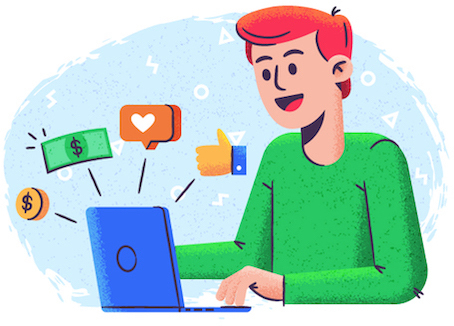 Track the engagements and get a clear idea of the percentage of people who watched your video, as well as see an audience retention chart. Check the likes, shares and comments in your feeds as with Instagram. With IGTV, cross promotion is easy. Use your YouTube channel to post teasers for your IGTV videos in the new vertical format. Create fresh new videos for IGTV and post them on Instagram, Facebook, and other social media platforms. When it comes to tutorial videos, nothing works better than food preparation. 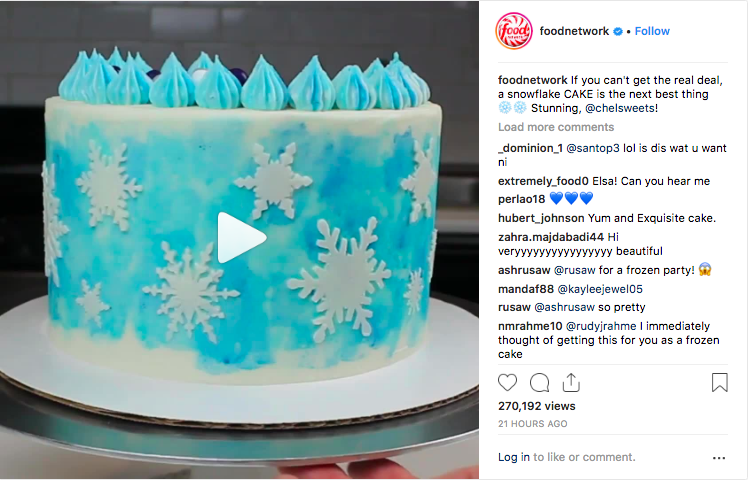 The Food Network has made great use of the IGTV platform to post quick and simple cooking videos, restaurant reviews and features, taste tests, and cooking competitions to take its viewer engagement up a notch. 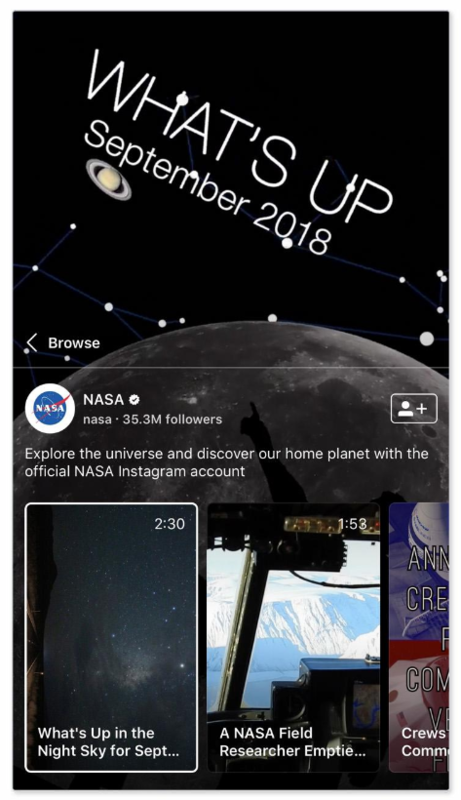 Now that they already have great video content and a large following (38.2 million followers), NASA has been repurposing their videos to post on IGTV. They are making the best of it by providing updates about their latest mission and stunning views of spaces they have captured. They have included content that is user-generated, captured by the astronauts which include videos of life on the space station. Their content is interesting, unique, educational and highly entertaining. They have ticked all the boxes and are making the best of IGTV. 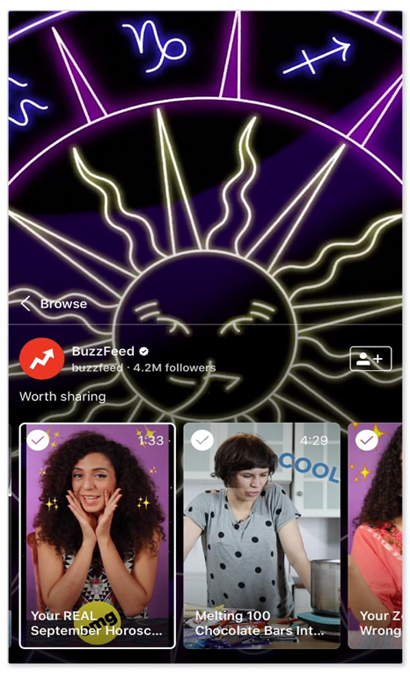 This trending content provider has found another way to provide you with the latest and the best – BuzzFeed has transitioned to IGTV well with videos on interesting topics, exclusive interviews, and challenges. As is consistent with their brand, they keep their videos short and sweet to keep the audience engaged and wanting more. Like NASA, National Geographic is known for its stellar content. 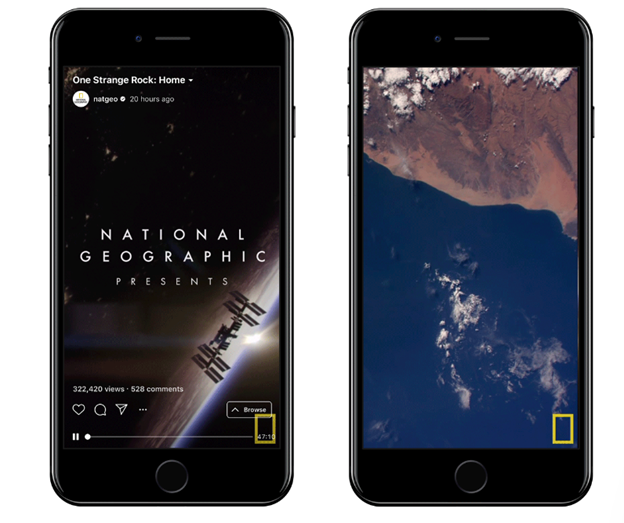 They launched their IGTV channel by sharing the first episode of their TV show “One Strange Rock,” hosted by Will Smith, which features an interview with astronaut Peggy Whitson. They’ve also been reposting their old videos in the new vertical format. All their content is interesting, beautiful, optimized and aligned to draw viewers. Netflix is known for setting social media abuzz with its innovative content. It is making a killing at IGTV, too, by creating content that is completely aligned to the platform. 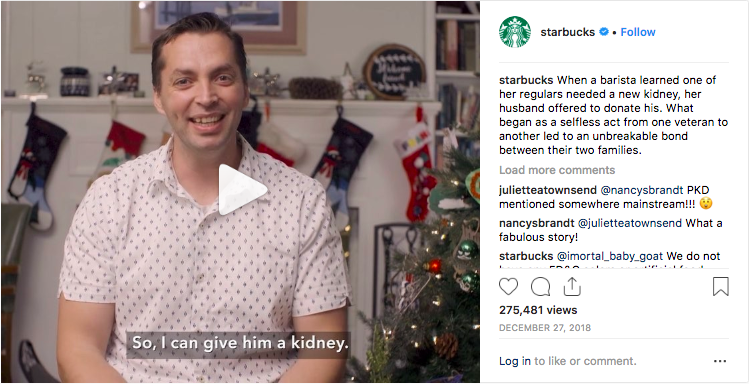 They’re doing everything right to appeal to millennials by including special promos, behind-the-scenes videos, interviews, and a lot more to keep its viewers glued to its channel. 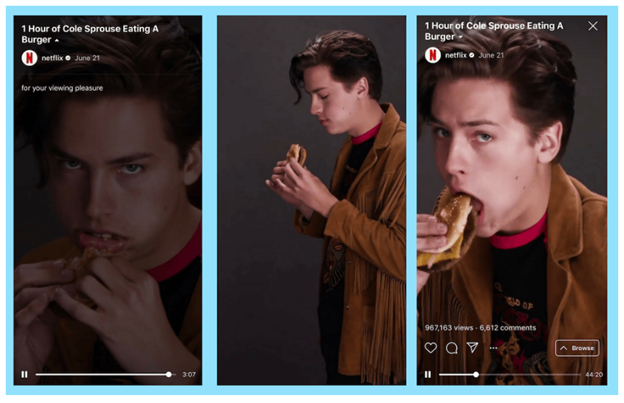 For example, Netflix launched their IGTV channel by posting a 60-minute video of the actor Cole Sprouse, from the popular show Riverdale, eating a hamburger. Believe it or not, this video got 967K views and around 6.6K comments! It was done to promote the latest season of Riverdale and appeal to a younger audience. IGTV has opened up a whole Pandora’s Box of opportunities for businesses and brands to capture and engage its audience. 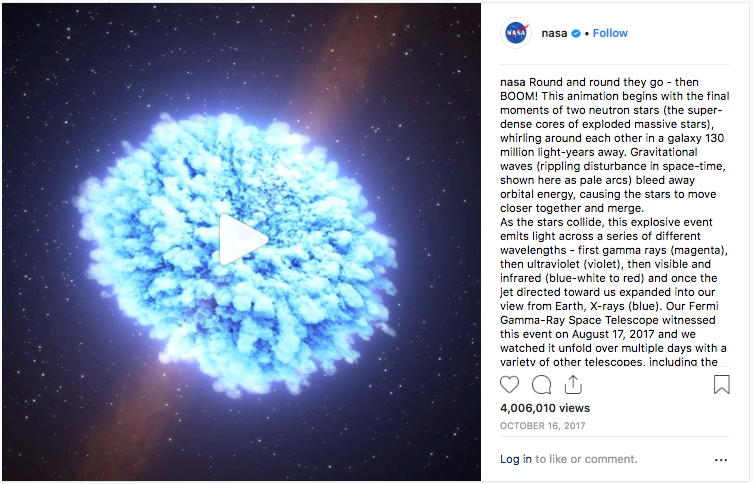 Its mobile-friendly vertical video format is definitely catching on with over 2.5 million installs since its launch in June 2018. It is still early to predict how it will progress, but one thing is for certain – the early bird gets the worm, so get your branding strategy together and include IGTV in your social media marketing.